Grappler is the newest item being added to Fortnite Battle Royale. The Grappler is a new movement based item that has been added to Fortnite. Learn how-to use it, where to find it, and some tips and tricks to get the most out of the Grappler! Epic has been adding a lot of items that help you traverse the map and make dynamic movements to the game recently. They've added Rift to Go, which spawns a Rift right on your location. 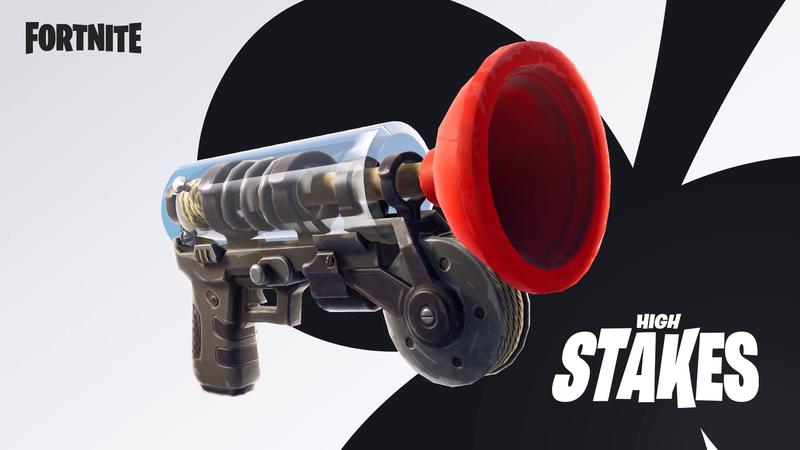 Then they added the Shockwave Grenade which is an advanced version of the Impulse Grenade. You can use this to bounce yourself through structures and longer distances while being immune to fall damage. The Grappler falls into line with these, as a way to quickly launch yourself towards areas you are able to land a suction cup on. You will find this Epic Rarity item in Vending Machines, floor loot, Treasure Chests, Supply Drops, and Supply Llamas. The Grappler comes with 15 shots, once you've used those up the item breaks. You can fire the Grappler at a wall or whatever to launch yourself forward. Whatever you are grappling towards will need to be somewhat close because you have limited range. You will be able to tell if you can hit a spot when the crosshair isn't showing an X. If you grapple once, you can also grapple again while still in the air and repeat this as many times as you can. I view this item largely like the impulse grenades, it's going to give you some dynamic and fast movements to surprise your opponents. You'll be able to burst forward or get to a spot you shouldn't be able to get to very quickly. This can lead to some surprise eliminations. While offense will likely be one of its main benefits, you'll also be able to use this to get out of fights quickly. It looks like you can traverse yourself upwards with this. If you suction cup to a lower portion of the wall, and disengage from it you seem to get a boost upwards. You can use this to get up to a higher spot if you quickly shoot the wall again after your first grapple. The big weakness of this is that you aren't getting any immunity to fall damage. So this item is going to cause some awkward situations where you are looking to make a good play but fall to your doom.